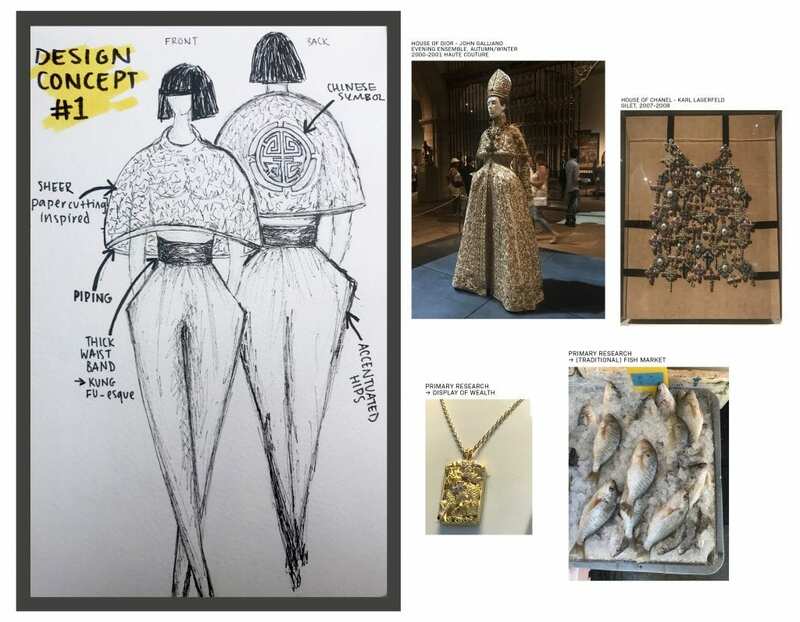 Today we went to the MET to see the “Heavenly Bodies: Fashion and the Catholic Imagination” exhibition, for secondary research, and to China Town for primary research. The topic area I was given was history – a subject I’m very interested in. Using the exhibition and the city as inspiration, I’ve developed two possible design concepts. I decided to focus on the themes of wealth, status and reputation because they are extremely valuable in Chinese culture – both historically and currently. These themes were explicitly seen at the “Heavenly Bodies: Fashion and the Catholic Imagination” exhibition, which made the audience feel meek in comparison to the regal dresses. The shape of the top in this design is inspired by Dior’s EVENING ENSEMBLE, autumn/winter 2000-2001 haute couture. I also took inspiration from the art of Chinese papercutting – historically used as a method of storytelling. The symbol on the back is one that I saw at a door in China Town – I’ve also seen it plenty of times in Hong Kong – and it means ‘good luck’ or ‘prosperity’. Fascinated by the history of the creation of China Town, I decided to draw further inspiration from its first settlers – workers and fishermen – specifically their comfortable and loose attire. I wanted to highlight the female figure which is why I’ve also created a visual illusion in order to exaggerate the proportions (waist). With the same focus in mind, (wealth, status and reputation), I created my second design concept. The yoke/sleeves are inspired by the Versace leather jackets at the MET exhibition. I’d consider creating that section out of leather or a similar tough fabric in order to emphasise the idea of power. 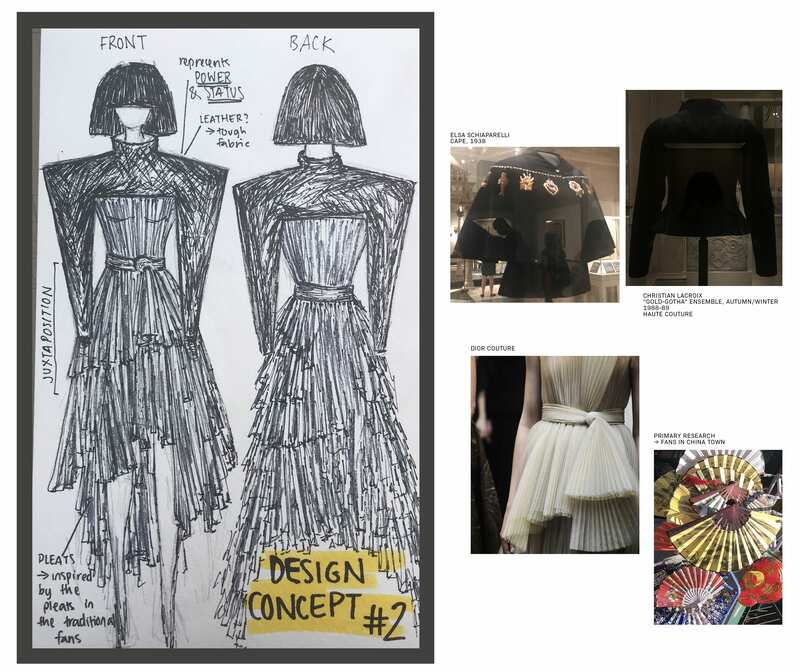 This concept is juxtaposed with the sheer pleated dress underneath – once again inspired by Dior. I chose to use pleats because the traditional Chinese fans are ‘pleated’, and it would be an interesting balance between soft yet structured. Furthermore, the fans were typically used by the upper class – which relates to the ideas of status and reputation. I envision the pleats being a muted, light colour as white symbolises purity and fulfilment (and mourning) in Chinese culture. This design concept is less explicitly ‘Chinese’.